Adulteration of food products with melamine has become a major public concern as consumption of melamine can lead to kidney stones and failure. Hence, development of analytical techniques for the timely detection of melamine is crucial and plays an important role in surveillance. Methods are still in development to reach an ideal method that has high sensitivity and specificity, and a short analysis time. Recent advancements in ion source technology have introduced laser diode thermal desorption (LDTD), allowing ultra-high-speed analysis with LCMS. This system also enables high-throughput analysis when used with 96-well plates designed for LDTD-MS. With a simple switchable system between LCMS and LDTD, detailed LCMS analysis can be conducted on complex compounds, prior to direct analysis using LDTD. 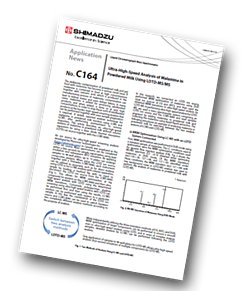 In this application news, laser diode thermal desorption (LDTD) was coupled with an LCMS-8060 triple quadrupole mass spectrometer (LDTD-MS) to conduct high-speed analysis of melamine in powdered milk. With the LCMS-8060, MRM optimization was first performed using dual ion sources (DUIS) of ESI and APCI with a standard sample of melamine. 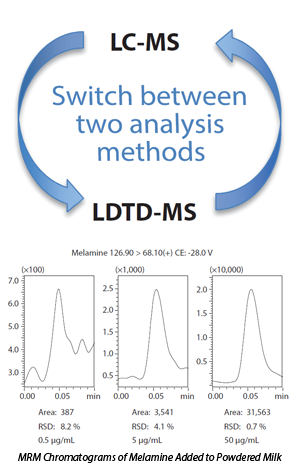 Subsequently, melamine added to powdered milk was extracted and analysis was carried out using LDTD-MS. With a short ionisation time of just six seconds, the method showed good repeatability (%RSD < 10%) and observed good linearity (R2 = 0.998), proving to be a reliable and efficient method for melamine analysis.